GOSHEN—On July 18, members of a committee of the Orange County Legislature voted unanimously against raises for their positions and two other elected officials over four years. The issue was first broached by Legislature Chairman Stephen Brescia at a committee meeting last month, with a proposal to give unspecified raises to legislators, the county executive, and the county clerk. With little dissent, two committees approved 2.75 percent increases for all the aforementioned positions for four years, but the issue was sent back to committee at the full legislature meeting July 7 after a resident spoke out strongly against it. 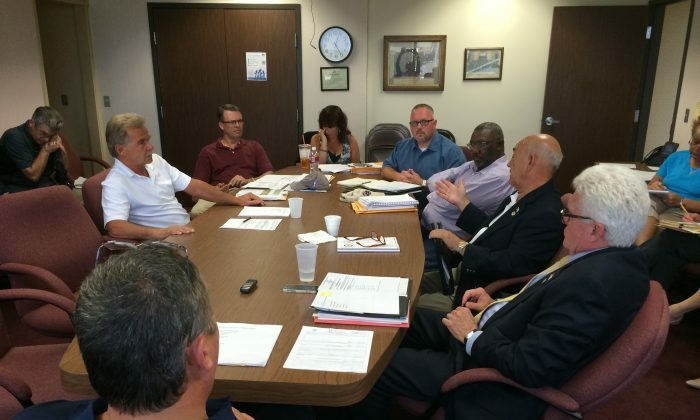 Legislator Paul Ruszkiewicz said at the July 18 committee meeting that he might have supported pay increases for elected officials, but felt it would be hypocritical after a proposed 3 percent pay cap increase for managers failed in committee. Legislator Tom Faggione, who opposed pay increases for legislators, said he might have considered an increase for the county clerk if compensation for that position was well behind other counties’. However he was outvoted six to two to lump the county clerk in with the other elected officials. With zero percent increases, legislators may actually be taking a pay cut, pointed out legislator Michael Paduch, because they currently contribute 12 percent towards their health insurance, and health insurance costs can rise. I just have a problem with everyone talking that we’re worried that our constituents don’t think we’re worth the money. “I don’t have a problem with the salary, I just have a problem with everyone talking that we’re worried that our constituents don’t think we’re worth the money, or whatever it is,” he said. Legislator Leigh Benton also chided fellow lawmakers for being worried about re-election over this after some of them voted to increase the sheriff’s salary by $7,000 earlier this year. “What you should be worried about is getting voted out of office because you did give the $7,000 raise to the sheriff,” he said. The proposed package of increases would start in 2018, the beginning of the next term and the end of a four-year pay freeze elected officials took in 2013. Defenders of the increases pointed out that they weren’t raising their own salaries because they might not be re-elected in 2018. Brescia said he brought the issue up earlier in the year hoping they could resolve it sooner rather than later so they wouldn’t have to decide it in an election year. The issue will be addressed again at the July 20 Rules, Enactments, and Intergovernmental Relations Committee meeting.